This itinerary explores historic Brunswick and the C&O Canal towpath both east and west of town. In 1753, Brunswick was part of an original 3,100-acre land grant to John Hawkins from the King of England, George II. The land was known as “Merry Peep O Day” because the rising sun could be seen directly over Catoctin Mountain. In 1780, the land was deeded for four town lots, and in 1837, John McPherson bought the new little burg. 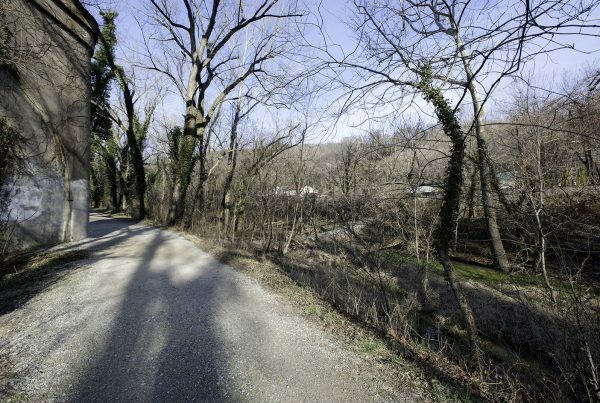 The original town was situated between where the railroad tracks lie today and the C&O Canal. Both the railroad and the canal arrived in 1834. Together, the museum and visitor center interpret these two important transportation systems. Peek into the lives of “canawlers”—those who made their living along the canal—as well as the railroaders who brought the B&O to town and kept it running. The museum recreates rooms in early 20th-century homes, depicting how residents lived. The top floor features 1,700 square feet of model railroad and Brunswick’s rail yard shown extending all the way to Union Station in D.C.
Next, take a walk or short bike ride through town to see some of Brunswick’s historical sites. From the C&O Canal Visitor Center and Heritage Museum, head east on Potomac Street and cross Maple Avenue. Head north (left) on Maple one block to East A Street and turn east (right). On the next block down you’ll see a tank in the road median. The M–5 “Jeb Stuart” Tank was a gift to the town from the US Department of Defense following WWII. An interpretive sign tells more about the 15-ton gift. Brunswick Mainstreet sponsors several events throughout the year, including History Days in April; the Great Brunswick River Race in July (make your own boat and sail it down the Potomac); Bicycle Festival in August; Railroad Days in October (music, festivities, train rides); Wine & Chocolate Walk in September (tastings from local vineyards paired with scrumptious treats), and a Victorian Christmas on Thanksgiving weekend. 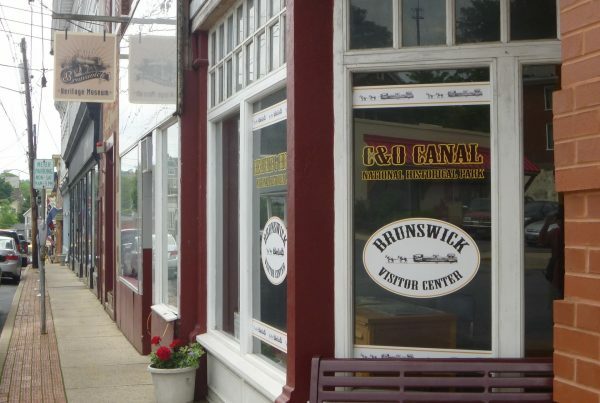 For a complete list of events, visit Brunswick Main Street. Construction of the Chesapeake & Ohio (C&O) Canal began in 1828 with a groundbreaking ceremony featuring President John Quincy Adams. The bold project would enhance commercial trade between Washington, D.C., and points west—all the way to the Ohio River. In 1850 construction stopped at Cumberland, MD, in the wake of numerous difficulties. The Baltimore & Ohio Railroad (B&O) then replaced the canal as the primary mover of goods. 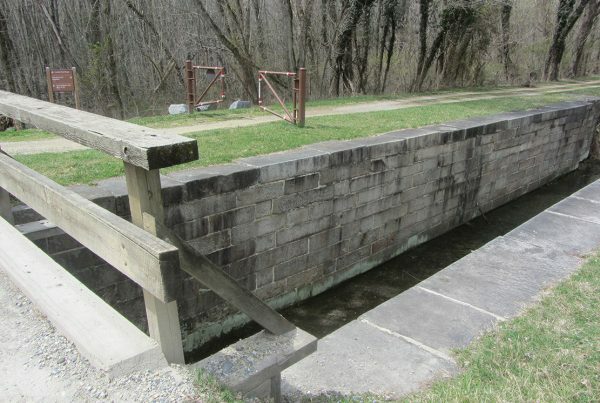 Today the towpath is the Chesapeake & Ohio Canal National Historical Park, offering 184.5 miles of recreation by foot, bicycle, or horse (permits may be required). 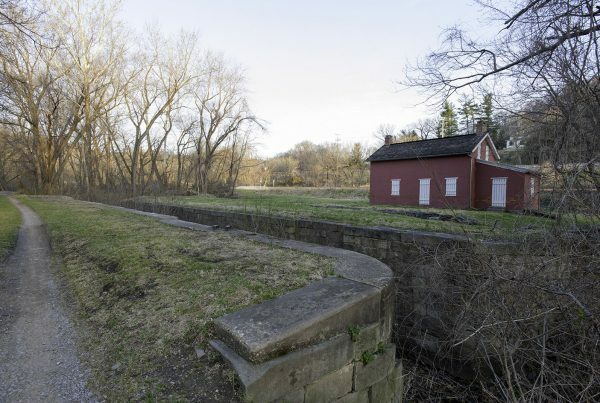 The C&O Canal wasn’t just for transporting goods; many 19th-century entrepreneurs took advantage of the flowing water to power mills. Near Lock 30 at Brunswick, businessman Charles F. Wenner operated a flour mill. Corn, wheat, cotton, and lime were also processed along the Canal. During the Civil War, operations along both the canal and railroad were attacked, creating financial hardships for people whose livelihoods depended on them. Confederates sabotaged sections of track and destroyed bridges, raided and burned canal boats, and blew up locks in attempt to cut off supplies for the North. Mercifully, the towpath is now a peaceful refuge for cyclists, hikers, and horseback riders. The heavily wooded corridor makes for a cool excursion during hot summer days. When the trees are bare, you can enjoy beautiful views of the Potomac River. 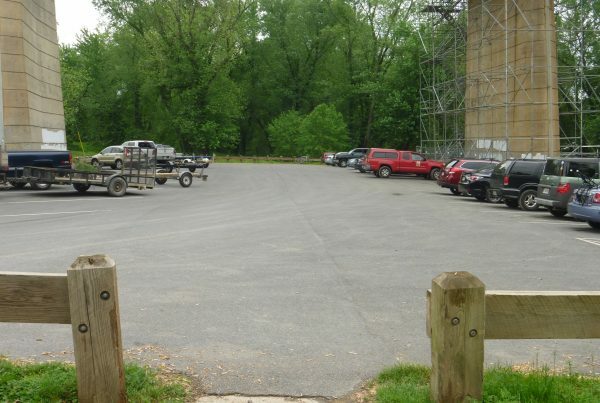 Access the C&O Canal towpath by crossing the tracks at the south end of Maple Avenue (park in the commuter lot). A wooden covered bridge was built near the old town site just before the war and destroyed in 1861, one of many bridges sabotaged by both North and South to prevent the enemy from crossing the river. Union troops cobbled together a pontoon bridge near the old bridge ruins in October 1862 so they could pursue the Confederates after the Battle of Antietam. Following the Battle of Gettysburg in 1863, thousands of Confederate troops streamed toward the Potomac River on their way to Virginia. Brunswick, called Berlin then, was one of many river crossings. You can read more about the many skirmishes that took place near Brunswick during the war in the “Pocket Guide to the Civil War on the Chesapeake & Ohio Canal” and the book “Trembling in the Balance: The Chesapeake and Ohio Canal During the Civil War,” both available at C&O Canal visitor centers. Heading upstream (west) along the towpath, it’s only 5.7 miles to the confluence of the Potomac and Shenandoah rivers near Harpers Ferry, West Virginia. On the way you’ll pass Lock 31 near the site of the old Weverton cotton mill (mile 57.8). Take a footpath toward the river and look for remains of the sluices that took in water to operate the mill. Next up is Sandy Hook (mile 59.5), once home to a large Union supply depot. At towpath mile 60.6 a river lock for the Shenandoah aided boats crossing the Potomac. But floods have wiped out most evidence of the lock. 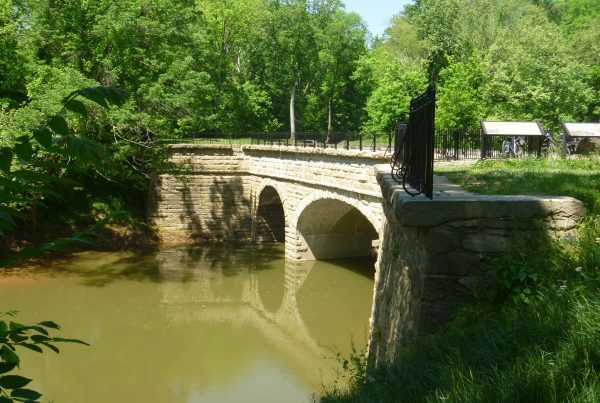 In March 1862, Union troops under Gen. McClellan crossed the railroad bridge just upstream on their way to Winchester, Virginia. 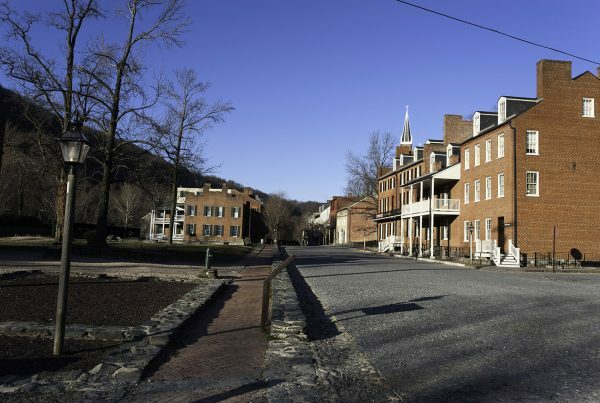 You can cross the river via a footbridge to visit Harpers Ferry National Historical Park, an important—and fought over—stronghold during the Civil War. If you continue west along the towpath from Harpers Ferry, you’ll encounter locks 32–36 and Dam 3. 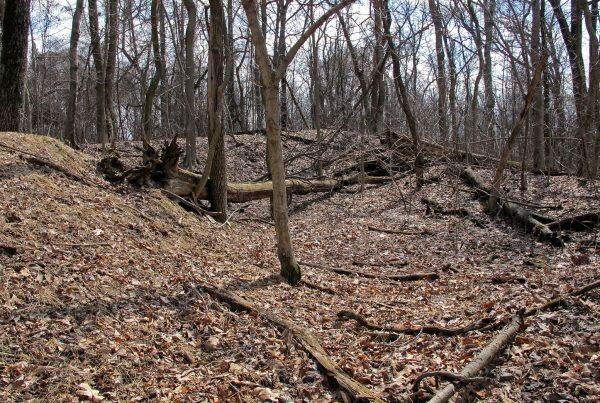 In addition, the ruins of Fort Duncan are visible by climbing the hill at towpath mile 62.4. Another option is to lock up your bike and set out on foot to explore Maryland Heights (mile 61.1). 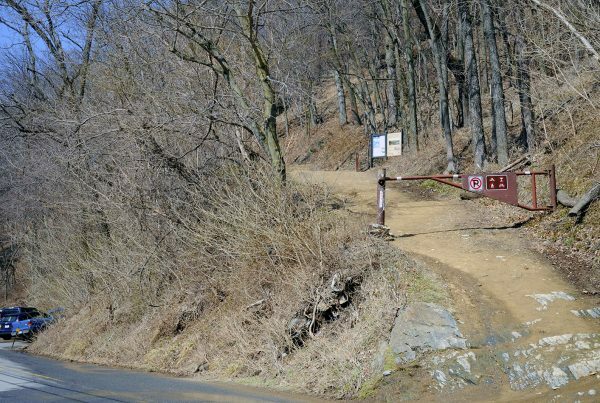 Cross Harpers Ferry Road and head up Elk Ridge on the old military road, a well-marked gravel road (no vehicles or bikes) leading straight up the mountain’s flank. The first 1.5 to 2 miles or so of the hike are steep, but the wide road is easy to navigate. Interpretive signs along the 5.2-mile loop hike tell the story of the fortified Union encampment and battlements built at the ridge top. You can do a short loop or a long loop. (Abraham Lincoln attempted the ascent but turned around partway because the climb was too steep!) 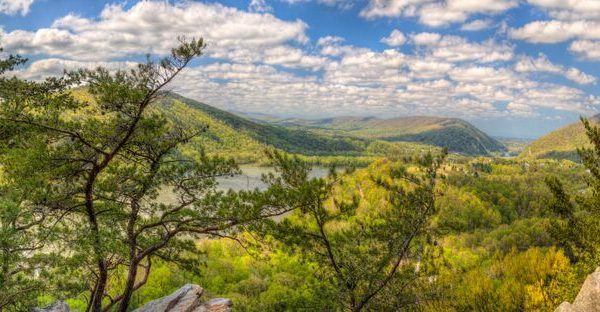 If you continue the climb, however, you’ll see what Mr. Lincoln missed: the spectacular views of Harpers Ferry and the valley to the west. The next ridge over is South Mountain. In September 1862, just before the Battle of Antietam, Confederate troops drove the Union out of Maryland Heights and used the strategic location to fire upon Union troops protecting Harpers Ferry, forcing its surrender. Again in both 1863 and 1864, Union and Confederate troops fought for control of Maryland Heights. Download an interpretive hiking pamphlet of the trail and a trail map from the National Park Service. 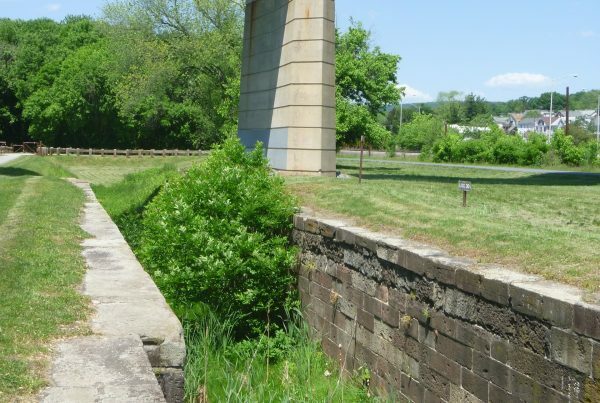 From Brunswick, head east downstream along the C&O Canal towpath to see the stunning Catoctin Aqueduct (mile 51.5), one of eleven such water-filled bridges along the C&O canal. The aqueducts carried boats over major creeks that emptied into the Potomac. Catoctin was rebuilt in 2011 using 459 of the original stones. The structure was known as the “crooked aqueduct” because boats had to make a sharp turn to enter it. Unfortunately, the aqueduct was never structurally sound and often leaked. The culprit was its elliptical center arch, weaker than the adjacent semicircle arches. Two arches collapsed in 1973, and the stones were buried until the aqueduct could one day be restored. Take the short trail down to the creek to a viewing area, where you can admire the reconstruction artistry. Interpretive signs describe the restoration. Next along the path is Lockhouse 29 at Lander (mile 50.8). It’s been and turned into a living history museum from the 1920s time period. You can see the inside on Saturdays during summer (11 am–2 pm). For more details email the Ruritan Club at [email protected]. There was once a turning basin here, but it’s now filled in. In June 1863, Confederates attacked a train near the lockhouse, following it to Point of Rocks, where they captured the engineer and 15 passengers before burning the train. Continue east to Lockhouse 28 (mile 48.9). Experience what life might have been like for keepers of the canal locks by spending the night in restored Lockhouse. Lockhouse 28 is part of the Canal Quarters program, and each lockhouse is refurnished to represent different eras during the days of the C&O Canal. Built in 1837, Lockhouse 28 represents the canal’s early days. The brick structure has no electricity or running water. The portable toilet is outside—and probably much more comfortable than the house’s original. You have to walk up the towpath to mile 50.3 to pump water at the nearby campsite, a true 1830s experience! Continuing east, before you reach the underpass below US Highway 15, you’ll see two railroad tunnels bored through the rock. 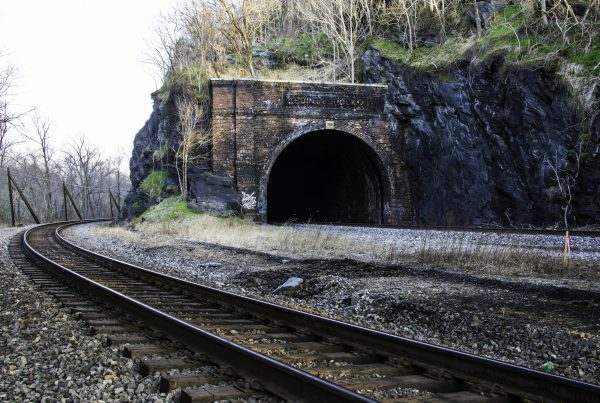 Catoctin Tunnel is first, followed by Point of Rocks tunnel, both blasted in 1868. Before the tunnels were built, however, the tracks and canal shared a narrow passage. In 1902 the tunnels were enlarged; brick facing on the entrances added an artistic touch. There was even a large turning basin just east of Point of Rocks tunnel, but it was filled with rock debris when the tunnel was blasted. During the late 1820s the C&O Canal Company and the B&O Railroad battled for a narrow strip of land just before the underpass for what is today’s US Highway 15 near Point of Rocks. After a four-year battle, the courts decided in favor of the canal. But the C&O Canal Company was nearly broke from legal fees, so they compromised with the railroad, which helped fund the canal in exchange for sharing the narrow strip of land. As a consequence, both the canal and the railroad share the slim passage between Point of Rocks and Harpers Ferry. Point of Rocks village is just east of US 15 (towpath mile 48.2). From here, you can enjoy other itineraries that trace the C&O Canal and Civil War.